Shows how the Barcode API's UDI label scanning features are used. 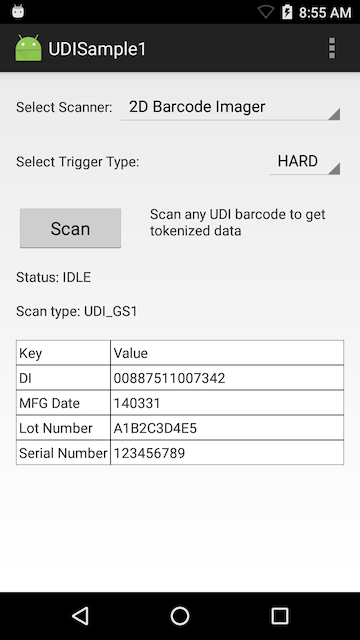 This sample application shows how the Barcode API's UDI Label scanning features can be used to scan Barcodes in a UDI Label. This API supports scanning of labels from three issuing agencies ( GS1, ICCBBA, and HIBCC). This sample illustrates a single use-case for implementing UDI label scanning features; it is not a comprehensive example of the many ways this feature could be used. For a complete example of barcode scanning implementation, see Barcode Sample 1. Although this sample may work with previous versions of the EMDK, it is advised to update the EMDK runtime on your device before loading this sample. 1. With Trigger type set to Hard, Press the Scan button to enable the scanner. 2. 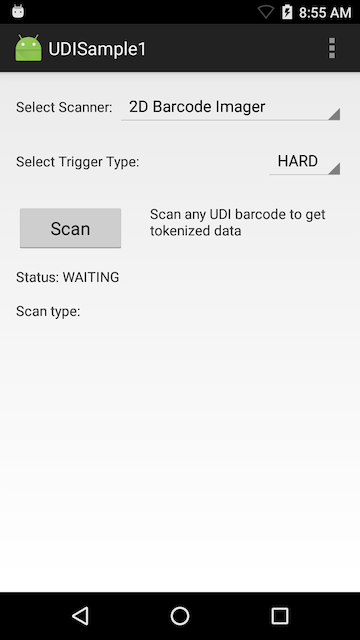 Now point the scanner of your device at a UDI Label and press the Hardware Scan Trigger. Upon a successful scan, the type of UDI label and a table of UDI Data will be displayed.